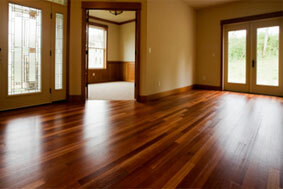 Installing Exotic Hardwood Floors is a great way to boost the look and appeal of your floors. There are many reasons to choose exotic hardwood and imported exotic hardwood over domestic hardwoods. The greatest thing about exotic hardwood floors is that they are unique and different than typical brands of domestic flooring. You will have a wider range of options with exotic hardwoods and there are many beautiful styles that you do not see in the most homes. This added expansion of styles does not come without a price. Exotic hardwood floors are typically more expensive, naturally. However, you can get away with some great deals on exotic hardwood floors as well! It is possible to find a Bamboo or a carbonized hardwood floor in the $2/bf (boarded foot) range. That goes to show, it is possible to install exotic hardwood floors without breaking the bank. You can even find laminate flooring in exotic styles! Those can be as cheap as $.99-$1.99/bf. Laminate flooring is extremely popular these days because it is stands up well to abuse and is very moisture resistant. Of course, you still can’t beat the natural look of wood if you’ve got the money for it.